The SPEC MIX® Specshot 5000 MS and MSA are preblended, high early strength, cement based products designed to be used for wet or dry process applications, such as underground work, tunneling or any other project where high-performance shotcrete is to be installed on vertical, overhead or horizontal surfaces. They can be custom designed and packaged to meet specific properties and/or project requirements. These preblended shotcrete mixtures are specifically formulated to produce a cohesive and fast-setting material with good shooting adhesion and strength characteristics. Specshot 5000 MSA is an air-entrained shotcrete mixture. SPECSHOT® 5000 MS and MSA are produced under strict manufacturing standards and complete quality control measures are implemented with each batch. A digital printout displaying the proper proportions of each batch is kept on file. Each SPEC MIX® manufacturer certifies that SPEC MIX® shotcrete products are designed to meet the project specifications and applicable ASTM and ACI standards. SPEC MIX® SPECSHOT 5000 MS and MSA are dry preblended products that may be used in either wet or dry processes. Shotcrete should be installed in accordance with the provisions of the national or local building code and the American Concrete Institute’s recommended practices (ACI 506R-90,”Guide to Shotcrete”). 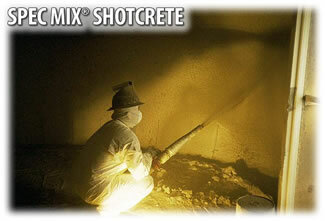 Shotcrete products should only be applied by an experienced and certified nozzleman. When combining water with the shotcrete mixture, either during mixing for wet process application or at the nozzle for dry process applications, use clean, potable water. Once water is combined with the shotcrete mixture, all of the batched SPECSHOT 5000 MS or MSA should be applied before a loss of consistency is experienced. This time period may be shorter in hot weather conditions. Dry conditions may cause the shotcrete to harden more rapidly. Prior to application of the shotcrete, the substrate should be cleaned and evenly moistened, but not saturated. Although SPECSHOT 5000 MS and MSA shotcrete reduces rebound, some rebound is to be expected. Do not incorporate rebound material back into the applied shotcrete. Once shotcrete is applied, a variety of finishing techniques can be used to achieve the desired surface texture. After the desired finish is achieved, provide sufficient moisture to permit continuous hydration of the cementitious materials for optimum curing.